I am needing to get some type of monitoring system for my truck. 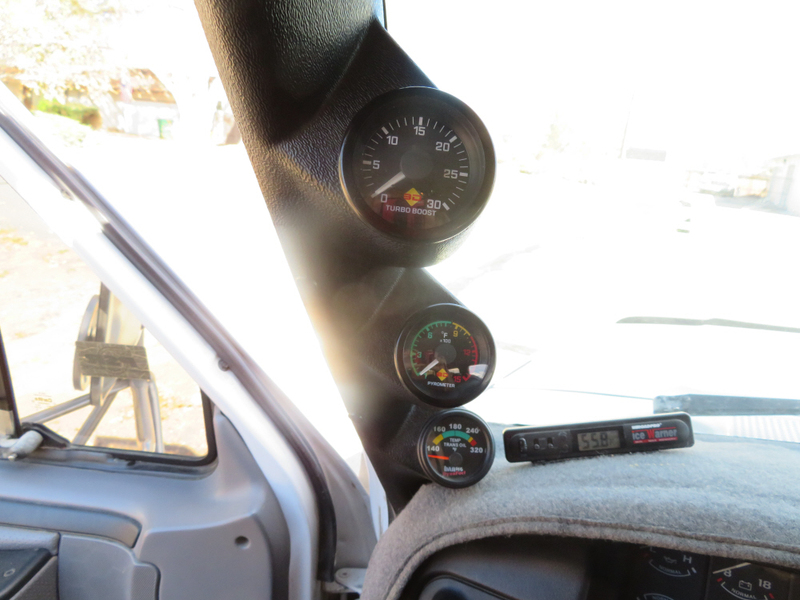 I was thinking some sort of analog gauges like the ones from ISSPRO and putting them into a pillar. The other option I was considering was a digital monitor like the Edge Insight CTS2. My main purpose eventually is to tow a trailer with my rig. What do ya'll run and what do you personally think the pros/ cons of each are. Any input is much appreciated. Thanks! I have combination of both. I'm old school and like to have a gauge I can look at but I also have Torque Pro on an old cell phone that I use for display too. There's a lot of parameters already in the PCM. You can spend $1000's on external gauges or you can see what your truck is seeing for less than $50. I have ISSPRO EV2 gages for EGT, trans temp, boost, and fuel pressure. I could have skipped on the trans temp but I got the gauges way before OBDII monitoring was a "thing". I have a boost gauge because I have a boost fooler so the truck will never see over 24 psi, and the truck didn't come with a sensor for EGT or fuel pressure. Last edited by brian42; 12-14-2018 at 10:51 AM. Did you ever get a hydra or another tune loader? I'm getting to where I like both, for different reasons. I like old school pod gauges. They are reliable (autometer, isspro) and do their job. Edge products just don’t seem to last. I’d say on average they last 5-8 years. There is always threads about them failing on the various forums. Thanks for th replies fellas. I’m looking at some pillar pods and would probably be leaning towards a tripple so I can monitor egt, boost and trans temp. It looks like there are two types of pillar mounts. One that completely replaces the pillar and factory matches and one that is just a skin that mounts to the current pillar trim. I am only interested in a factory match full pillar piece, not the skin type. Who makes the best one? What obd2 plugin are you using with the phone app? I think most of the cheapo ones you can get don’t work right with our trucks? I prefer the obdlink mx. I don't know how many different companies make pods but my Autometer overhead pod is a perfect fit. I have used two over the years: PLX Kiwi for years and most recently OBDLink LX for the past year. Both have been great. I use an old Android phone as my display so the BT does me just fine so I went with the LX. If I ever decide to use my iPhone then I'll upgrade to the MX for the Wi-Fi connection. You should look up the specs a little more. Mx is more advanced than the lx, allows access to CAN. Yes the MX supports CAN. I was only speaking to the reason(s) I chose the LX over the MX. I only use this on my truck so have no need for any protocols other than J1850 PWM. All the features I am looking for are in the LX so I saved a few bucks to put towards my next oil leak. 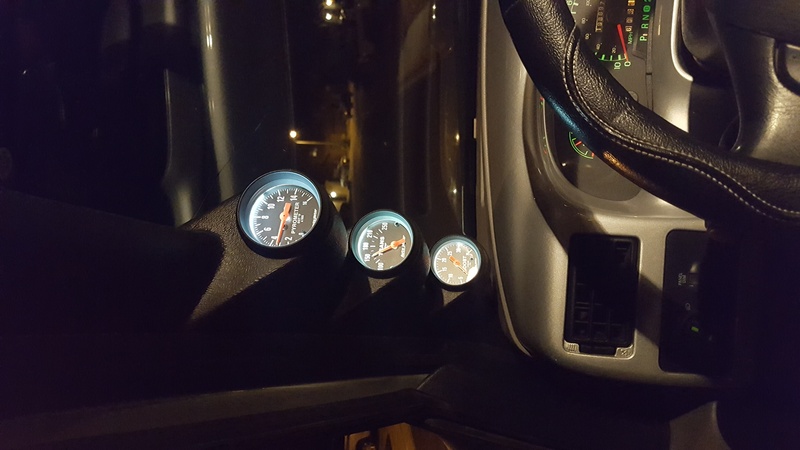 Here's the gauge setup I had on my 97 7.3. Simple and to the point. And note the hi-tech outside temp thermometer . . .
How does the pillar pod mount to the a pillar? Really like my Autometers. The pillar pod mounts over the stock pillar with 3 plugs and is seamless.